The tasting panel explored the stylistic diversity of Pinot Noir being produced currently in the Anderson Valley. 2013 Roederer Anderson Valley Sparkling Wine Harvest Brix 19º, pH 3.14, TA 0.90. Early pressing fraction. Picked at high acid showing intense citrus and acid-driven minerality. 5 tons per acre. Minimal skin contact, bladder pressed. Acid profile with essentially no astringency. 2013 Balo Anderson Valley Pinot Noir Blanc Harvest Brix 21.7º, pH 3.13, TA 0.70 - close to sparkling base. Clones “828” and 777. 3.3 tons per acre. 100% whole cluster, barreled in 75% stainless and 25% oak. No malolactic fermentation. Finished alcohol 13.6%, pH 3.23, TA 0.79. More body, fruit flavor than sparkling wine. Very crisp with berry, lemongrass and peach flavors. 2013 Navarro Anderson Valley Rosé of Pinot Noir Despite the high prices for Pinot Noir grapes and vineyard land, it is still possible from a cost standpoint to produce rosé in Anderson Valley. The majority of this wine is from Navarro’s Hammer Olsen block in Philo with about 10% from Navarro’s Boonville vineyards. Since Philo is closer to the Pacific Ocean, its a little cooler and produces wines with rose petal aromas and strawberry flavors. Boonville produces fruit flavors more reminiscent of raspberries. Harvest Brix 23.8º, pH 3.25. Chalone selection Pinot Noir with 7.5% Chardonnay contributing a peach component. Yield 4 to 4.5 tons per acre. Cold soaked 3 hours, then pressed. Fermented in stainless steel for three days, then sent to older barrels and aged sur lie. Finished alcohol 13.6%, pH 3.23, TA 0.79. Aromas and flavors of strawberry, cranberry and peach with bright acidity. 2011 Knez Cerise Vineyard Anderson Valley Pinot Noir Cerise is an 18-year-old vineyard spread out over 4 ridges and includes 13 blocks. Fruit from this vineyard can be a challenge to vinify as it can be powerful with aggressive tannins and an herbal and tobacco flavor element. Winemaker Anthony Filiberti is trying to craft more elegant wines without sacrificing mid palate intensity (power without weight). This wine has the scent of whole cluster with notes of cherry, spice and floral elements. Sappy, yet elegant with an intense attack, modest tannins, and a cherry-driven finish. 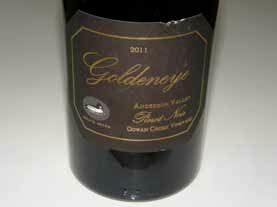 2011 Goldeneye Gowan Creek Vineyard Anderson Valley Pinot Noir Harvest Brix 25.0º. Aged 16 months in 60% new French oak and 14 months in bottle. Finished alcohol 14.6%, pH 3.80, TA 0.50. Vineyard is located centrally in the Anderson Valley at about 300 feet above the Navarro River, and containing considerable river rock. The vineyard is divided into 10 blocks and 8 clones. Primarily clone 777 with some Pommard and Mt Eden. A full-bodied wine with a velvety texture and a good tug of oak. Purple fruits are featured with a note of pennyroyal. Lush from this cool vintage but not jammy. (See my full review later in this issue. 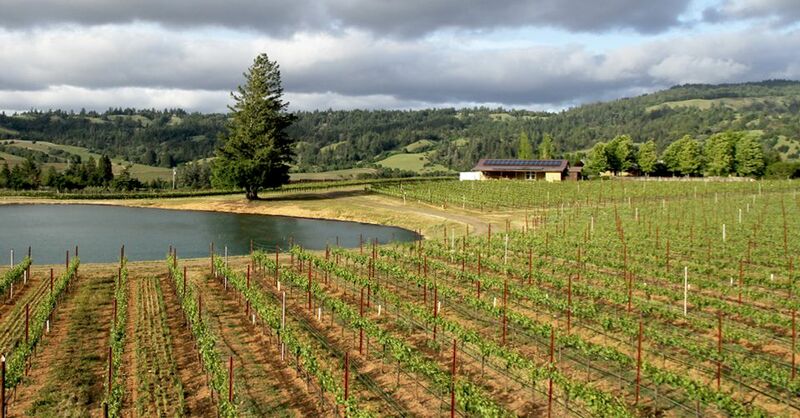 Pennyroyal grows wild in the Anderson Valley and many producers including Black Kite, Goldeneye, MacPhail and Woodenhead have noted that the aromas of some of their Anderson Valley Pinot Noirs feature pennyroyal. You can impress your friends by throwing out, “I smell pennyroyal in this wine,” when tasting an Anderson Valley Pinot Noir. Brian Zalaznik is a New York native who developed a love for wine working as a waiter in notable restaurants while in school. After college, he has been successful in the financial services sector for over twenty years, and is currently a Managing Director at Wells Fargo Securities. He lives in Mill Valley, California. Zalanik lost his older brother, his brother’s wife and their three sons in a tragic airplane crash in 2004. Afterwards, he looked for something that offered renewal in his life. Coincidentally, he was completing an internship at a winery and heard of a property for sale in Philo owned by a family of homesteaders from Oklahoma. The property was in disarray with remnants of a dormant Christmas tree operation. He decided to resurrect the property and plant a vineyard so he could channel his loss into a lasting homage. The property was acquired in 2005 and planted to 12 acres (9 clones) of Pinot Noir the following year. It is located in the “deep end” of the Anderson Valley on a plateau that sits 300 feet between the Navarro River and Highway 128. Brian and his wife Cindy operate Angel Camp Vineyard assisted with vineyard management by Tony Sanchez of Ardzrooni Vineyard Management. Angel Camp Vineyard debuted its second vintage, the 2012 Pinot Noir and Pinot Noir Blanc at this year’s Anderson Valley Pinot Noir Festival. The winemaker for the 2011, 2012 and 2013 vintages was Jon Keyes. Phil Baxter became the winemaker in 2014. Grapes are sold to three wineries: Chenamé, Donum Estate/Stemmler and Dutton-Goldfield. The panelists all agreed that site overrides clone and that this site is very special. The cool microclimate is key. Average temperature for Anderson Valley is 64º, Russian River Valley 66º, and Carneros 69º. The three wines were all stellar indicating that this is a vineyard of special promise. 2012 Angel Camp Vineyard Anderson Valley Pinot Noir 13.8% alc., pH 3.46, TA 0.66, 353 cases, $52. Clones 667, Pommard 4, David Bruce, Martini and Swan. Harvest Brix 24.3º. 100% de-stemmed. 4-day cold soak, 17-day fermentation, aged in 40% new French oak. A vibrant wine featuring aromas and flavors of dark stone fruits, dried herbs and an earthy underpinning. Rather elegant and nuanced, with well-managed tannins and a generous finish. 2012 Dutton-Goldfield Angel Camp Vineyard Anderson Valley Pinot Noir 13.8% alc., pH 3.66, TA 0.59, 306 cases, $58. 100% de-stemmed, 5-day cold soak, 21-day co-fermentation of Pommard, “828,” and 667 clones, aged 11 months in 50% new French oak. Explosive aromas of black cherry, black raspberry, spice and sweet oak lead to a medium to full-bodied core of lush and zesty black raspberry and black cherry fruits with hints of cola, Asian 5-spice and dark chocolate. Juicy, with a velvety mouth feel and a supple finish that is remarkably long and focused. 2011 Donum Estate Anderson Valley Pinot Noir 14.3% alc., pH 3.92, TA 0.54, 312 cases, $72. A blend of 115, 667, 777, 2A clones and David Bruce and Swan selections. 1-week cold soak, two fermentations (Dijon and other clones and selections, 50/50). Aged in 54% new French oak barrels. Barrel selection before bottling. Inviting aromas of black cherry, black raspberry, blackberry, root beer, floral bouquet and oak vanillin. Full-bodied and well-structured with deep, dark black berry and black raspberry flavors with a hint of cola. The flavors tiptoe to the edge of ripeness, but fall short of going over the edge. A bit impenetrable and needs more time in bottle. The book, Postmodern Winemaking: Rethinking The Modern Science Of An Ancient Craft, published in November 2013, was written by one of the leading innovators in wine production techniques and the founder of Vinovation. Clark Smith is the winemaker for Diamond Ridge Vineyards and his own WineSmith Cellars and consults for numerous wineries. Wine & Spirits said about the book, Postmodern Winemaking, “This is a brave book, fusing data, experience and intuition in a way that scientists rarely attempt....It’s a significant and much needed contribution to the literature of winemaking.” The magazine named it 2013 Book of the Year and it has been widely praised by others as well. Myself and others at the Conference were impressed by Smith’s grasp of scientific concepts associated with winemaking, his thought-provoking pronouncements and his provocative views. That said, much of his discourse was way beyond the grasp of all but the most knowledgeable wine professional. The book will probably find its biggest audience among winemakers and winemakers-to-be. I did record his talk and plan to post it in the future on my website. If you would like a copy of his presentation, contact Clark Smith through his website at www.winemaking411.com or phone 707-237-7000.